Firefighters are pictured near a damaged barn Tuesday evening after a grass fire spread and damaged the barn and caused minor damage to a house. NORTH WEBSTER — A grass fire spread to three residential yards and a field along East Backwater Road Tuesday night and damaged a barn. 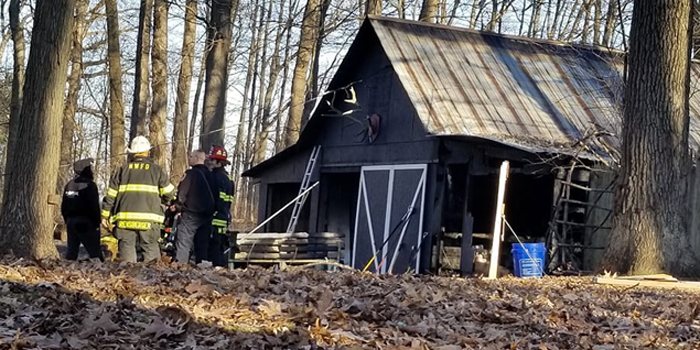 Firefighters were unsure how or where the grass fire started, but North Webster Tippecanoe Volunteer Fire Department Senior Battalion Chief Cody Manges said a barn behind the home at 8337 E. Backwater Road sustained damage. About two-thirds of the barn was burned. The house also had minor damage, Manges said. North Webster Tippecanoe Fire Department responded to the fire at 5:12 p.m., and was assisted by Syracuse Fire Department. The fire was under control by 6 p.m., Manges said. Kosciusko County Central Dispatch also received a report of a grass fire in Etna Green early Tuesday night. No details were available.